Your life is a story and every once in a while that story becomes a fairytale. Jessica and Alex started off just two kids with part time jobs, working together. Day in and day out they grew to learn more about each other, socialize at work, then after work, and then something magical occurred. They fell in love! Jessica had worked with her parents in their photography company for years and watch all the beautiful intimate weddings that he got to photograph at Paddlefish. It was no big surprise that when Alex proposed, they knew exactly where they wanted to get married. With a spacious deck on the 3rd floor, high above Disney Springs, and delicious culinary delights, they knew this was the perfect fit for them. Victoria with Intimate Weddings of Orlando booked the venue, vendors, and made sure every detail was taken care of. 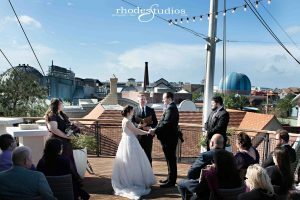 Brad with Rhodes Studios Photography and Video captured every moment of the day. From Jessica’s walk down the aisle, their ceremony, to the first dance and the lunch reception, they will have photos and memories to cherish for a lifetime. Flowers by Lesley took great care to create the custom bouquet and boutonniere for Alex and Jessica. With dahlias, garden roses, peonies, lambs ear, dollar eucalyptus, and a host of other beautiful flowers, it fit the two of them perfectly. The couple also used the services of Married by Mail to get their Florida Marriage License for them. With their busy schedules it made wedding planning more simple and stress free. He also gave them a homework assignment to write and say why they loved each other. I cannot begin to fathom how I could express the depth of my love for you in this short letter, as words do not even contain the power to describe the true nature of the bond that we have formed together. I never imagined meeting someone with such a caring heart and affectionate soul as I have found within you, and it makes me wonder every day what I could have possibly done to deserve such a loving relationship as you give to me and our family. The best part of all is that I know this love will continue to grow each day beyond my comprehension as long as we keep working at it and not let the world around us get in the way. I can’t wait to see where our life will take us and what adventures we can share together, knowing that no matter that future may be -it will be amazing as long as I am with you. Although I currently may not possess the capacity to tell you completely what you mean to me, if you let me I will spend the rest of my life working hard to prove to you why our love transcends all other forces in the universe and to reflect upon you the magical power that you have shown me with your everlasting love and devotion. Alex and Jessica we wish you happiness for a lifetime.